What weird crap do you have in your freezer? I was sat on the sofa on Monday night, having had a really unproductive day. I’d had a migraine the night before and was feeling generally yukky and like I’d just not achieved anything. When I feel like this I often find myself wanting to do weird jobs around the house that are kind of not very important but also somehow wholesome feeling. I had a flash of inspiration – my FREEZER. I would to write a three part blog series about my freezer. I mean come on, you’re excited already aren’t you? Not even just a single post – a three part series! The second one is the worst and will probably result in me, come summer, having to burn my car in a field somewhere. 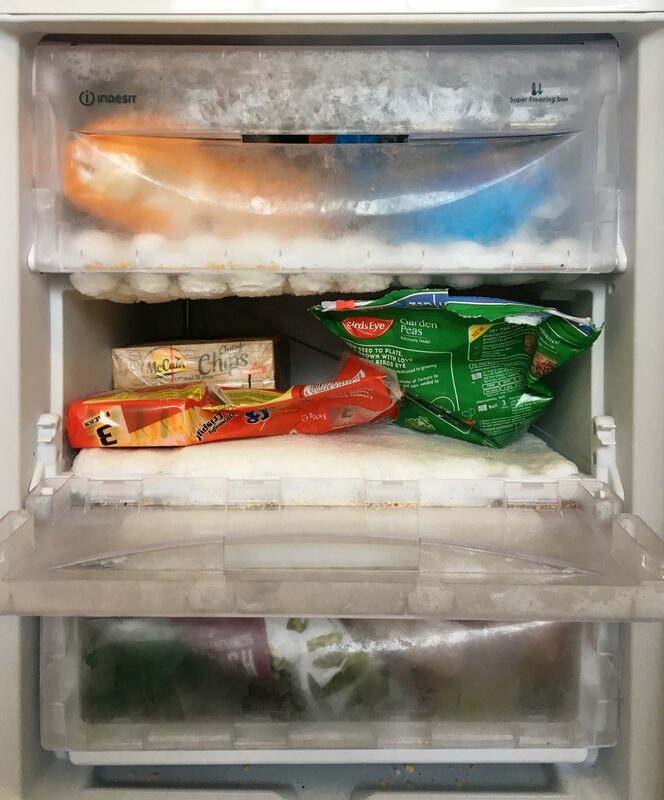 Then I thought I couldn’t really do a freezer-hacks style post with my freezer as it is, all frosted up and scratchy sounding – it just wouldn’t be right. But then it occurred to me that in 40 years I don’t think I’ve ever known how to defrost a freezer properly. I’m guessing my ‘chiselling at the freezer walls with a knife’ method is not what proper grown ups do. So there’s post two – how to defrost a freezer without cacking it up. I’m warning you though, it will be a challenge to beat the woman on Twitter who told me that they’ve had a whole crab in their freezer for seven years and that he’s called Dave the Destroyer. I should probably tell you now that I’m not much of a hoarder, and I’ve only lived in this house for 18 months, so I’m not going to find Findus Crispy Pancakes dated 1983 or anything, plus my freezer is quite small, but still, it’s always fun having a nose inside other people’s stuff isn’t it? I got everything out onto the floor and here’s what I found. It’s not really that much is it? Bought once but 95% remains as Belle has issues with texture and will only eat spinach raw. An absolute staple. Two bags, both opened, because I’m never entirely sure whether I have any or not and quite honestly am NOT PREPARED TO TAKE THAT CHANCE. My freezer if officially 17.6% chips. And yes, I do have two different types of microwave chips. Microwave chips are Belle’s new thing and so I am testing out different style of chip to see which she likes best. Some people might say I need a job that takes up more of my time, but what do they know? Possibly meatballs? I really need to write on the bags. I know for a fact that these have been here for AT LEAST three months and I’m not sure they’re at their best any more. Contrary to popular believe, freezing something does not STOP TIME. Although technically bacteria won’t grow, so you’re not going to poison yourself or anything, there are guidelines for how long you can freeze different things, (this is useful), before flavours and textures start to deteriorate. It looks pasta based. Sometimes I go through these phases where I decide I’m going to do wholesome things like cook meals in bulk. 10 – Some kind of bag of something? It’s to put on sore heads or bumps. This actually looks really nice and I don’t know why I haven’t eaten it already. Maybe I’ll have it for lunch tomorrow. I have to eat fish and seafood in individual portions as it’s one of Belle’s texture things. I am living for these. This used to be ice cubes but is now just a big lump, so if you want to break some off for a drink you have to bang it against the floor and scare the cats. Now it’s your turn. Go and have a look and leave a comment telling me about the weirdest or oldest thing you have in your freezer. *Can you tell that I made a vow to myself this year to only publish super interesting and useful content on my blog? You’re welcome. Glad to see I’m not the only person who has ‘mystery meat’ in their freezer! I know that my upright freezer in the garage needs defrosting. I have an idea of what is in there, as I went shopping yesterday. I have filo pastry from several years ago, when I thought it would be cool to make spring rolls, and Brie and cranberry parcels. I also have liver in there – because my husband likes it, and it is one of those things that I think I should eat, but have never been that keen, not even when mum was giving it to us on a fairly regular basis 40 years ago. 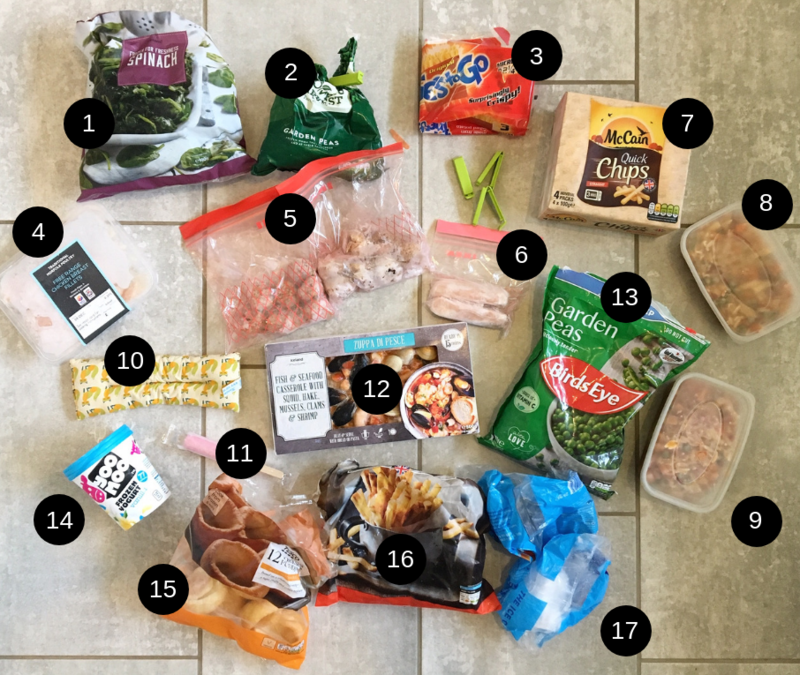 Some of the main components are frozen vegetables (I would die without my frozen veg…in there currently is broccoli, cauliflower, peas (two different brands), spinach, mixed veg, celeriac, brussel sprouts, pumpkin and a couple of other things too. Plus some fruit – raspberries, strawberries, blueberries and banana. There is also loads of bread/bakery stuff – we have cheese, cinnamon & sultana and wholemeal muffins. Bagels (multiple types both normal and thin), bread (white, wholemeal seeded and a few oddments), crumpets, hot cross buns and I’ll stop there! Loads of types of fish, meat, a few ready meals. Nuts, ice cream, some pizzas, I also usually have cooked pasta and rice in there…and tons more besides but I think you’ve had enough by now! Okay, so I was going to ask a question about the frozen veg and did you notice the texture changes but then… PUPPY CORPSE! Christ on a bike. I hope he is wrapped up or something, because if you sent a guest out to get a lolly and they open the freezer and a dog was staring at them, that might be a bit hard to explain! (Also very sad, sorry the puppy died etc). Yes to the texture changes – some veg more so than others. I’ve never tried frozen mushrooms or frozen courgette and I’m intrigued because they are so wet I can’t see how they would freeze and reconstitute well…. I have containers of all sorts of stuff. None of it labelled. whipped cream, coconut milk, fresh milk, stacks of mixed cooked roast veg(use to make soup). Weirdest thing in there is tiny jam jars filled with grated parmesan cheese as I bought a big block and needed to preserve it. I also have homemade stock (water from cooking the vegetables, no salt). I have chopped up peppers (unblanched) and sprouts. As previously discussed frozen ginger root grates brilliantly and no waste. I must admit that I have a large chest freezer and a small under the counter one too. Could go on…..
Blimey, that is one well stocked freezer – puts my three different types of chip to shame doesn’t it? The frozen bits of parmesan are, I have be reliably informed, great for adding to risottos! This made me laugh out loud. I’m so glad its not just me. The problem I find with freezers is that they get used for all the stuff that you cook and have too much left over to feel comfortable with throwing away. Consequently, I find I quite often have ‘freezer surprise’ for dinner as I also never seem to have the right type of pen to hand to label any of it. Chilli and bolognese are a particular problem as they essentially look the same. Defrosting is another thing altogether. I managed to flood my hallway in the summer whilst defrosting – I greatly under estimated just how much water it had in it and how many towels I should place around the bottom ‘just in case’. And then, later the same day my son left the door on it just slightly ajar when getting ice cream, so it frosted up again. I really enjoy these glimpses into the daily lives of my cousins across the pond (I like to think of Americans and you lovely people as cousins). But I have a few questions. First, is it not common there to have a self defrosting freezer? Saw a few comments about defrosting the freezer. Second, is in-door ice a thing there? Or an automated ice maker in the freezer. Third, microwave chips (yes I know what chips are). Do they not come out soggy?? What magic is this?? Fourth, quite jealous of your Yorkshire puddings. Fifth, PUPPY CORPSE OMG LOL. 1. self-defrosting freezers are a thing, but mine is a fairly basic model (cheap) and so it doesn’t have it it would seem! 2. Yes – my sister has a fancy fridge that makes ice but (see point 1) my fridge/freezer is cheap! 3. Well, you’d think they would wouldn’t you? They have some kind of special coated paper in the packaging I think, which is meant to crisp them? Well I can’t beat a puppy corpse, but THANK YOU – my Hub recently had a go at me for having two opened bags of peas in our freezer …..with one bag making a serious break for freedom all over the freezer drawer. In fairness, I moved only 2 months ago so I have fairly new stuff in my freezer AND it’s defrosted so at the moment I’m gloaty, but I’m with you on the inidentified sh!t (I have been known to defrost something just to find out what it really was) My Hub seems to think we should use things up in a rotational sort of way, but I’ve been fighting that one for years – neither of us is giving up any time soon. Hey, I didn’t realise they still made fries-to-go, they were my favs!!! Dave the destroyer though……………….still laughing.